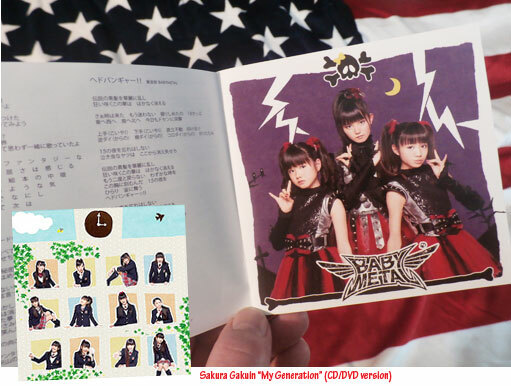 Added a bit of Babymetal history to the old collection this week, a Sakura Gakuin CD/DVD titled “My Generation” that was released in Japan on March 13 2013. The CD features 12 tracks from Sakura Gakuin projects like Babymetal (Heavy Music Club), Minipati (Cooking Club), Sleepiece (Go Home Club), Pastel Wing (Tennis Club) etc. Suzuka Nakamoto (Su-metal) sings a solo song and all in all it is very nice J-Pop, except for the “Headbanger! !” track from Babymetal. Little did they know then that this particular project would take off to the stars but they were already doing concerts and they were soon to be signed for bigger things to come. The DVD is what you really want here though, since it sports some really nice stuff. Especially a surprise party that the gals did for Suzuka since she was soon to graduate. This is very touching and it reveals how much love and respect that everybody felt towards her (she had been a Students Council with quite a lot of responsibility for the group for some time when this went down). You get to see a lot on these Sakura Gakuin releases, especially the DVDs. No other successful act has the early history captured as good as Babymetal on these early releases. You have to get this stuff on import from Japan but it is totally worth the effort if Babymetal is your thing.